I hate to admit this, but I have always used a boxed pancake mix, until now! I searched the internet for a healthy and delicious pancake recipe and found Cook’s Illustrated “Blueberry Pancakes,” published July 1, 2003. The recipe calls for 2 cups all-purpose flour, but I modified it by using 1 cup all-purpose flour and 1 cup whole wheat flour. Instead of using whole milk, I replaced it with 2% milk. Finally, I used organic ingredients when possible. In a medium bowl, whisk lemon juice and milk and set aside to let it thicken. Whisk together flours, sugar, baking powder, baking soda and salt in a large bowl. Whisk egg and melted butter into milk until well mixed. Make a “well” in the center of the dry ingredients and pour in milk mixture. Gently whisk ingredients together, until just combined—a few lumps are okay. Carefully stir in blueberries. Don’t over mix! Using a paper towel, spread about a teaspoon of oil in a 12-inch nonstick pan. Heat pan over medium heat. Using a ¼ measuring cup pour batter in 3 areas. When “bubbles” begin to appear, flip pancakes over and cook until golden brown. Recipe makes 16 4-inch pancakes. Serves 4 to 6. (Since there is only 2 of us at home right now, I was able to cut the recipe in half easily). This look lovely! 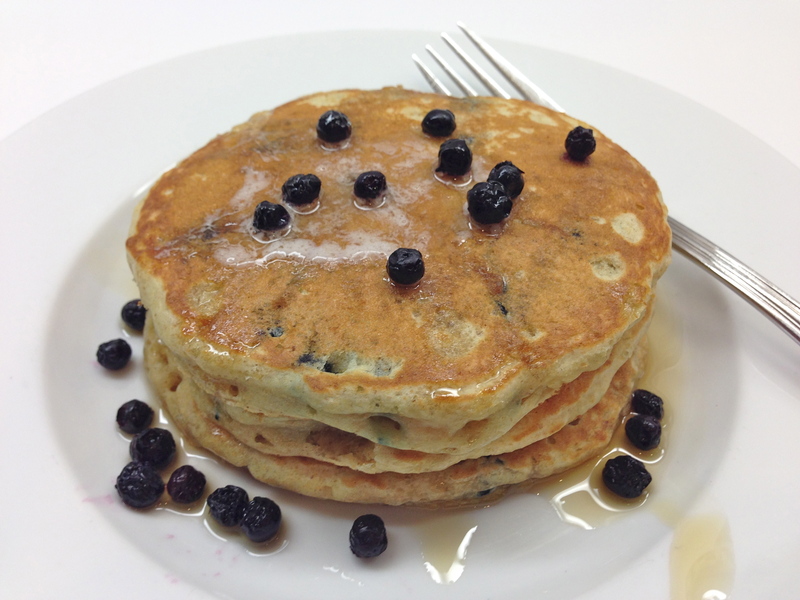 Check out my blueberry pancake recipe! Thank you for your “Like.” I bet your recipe is delicious too! Thanks for reblogging my blog.